When Mitchell Wolfson and Sidney Meyer formed the Wolfson-Meyer Theatre Company in 1925, they set their sights on building a state of the art theater in downtown Miami. The location they selected was on one of Miami’s most important streets. Once completed, their first theater would be called The Capitol Theatre and it would be located at 310 North Miami Avenue. Wolfson and Meyer intended to build a classy, “first-run” theater that would attract the best pictures of the day. The theater would feature an amenity that most Miami residents would not enjoy in their home until the middle part of the twentieth century. The Capitol Theatre was designed by architect E. T. Wells and was considered a Spanish influenced design. The contractor hired to build Well’s design was S. S. Jacobs Company of Omaha, Nebraska. Sidney Meyer grew up in Omaha, Nebraska, and graduated from University of Nebraska. This may have influenced Wolfson and Meyer’s selection of the general contractor. While the momentum of the building boom of the mid-1920s provided a lot of optimism for the Miami area, it also presented a lot of frustration to those competing for resources to complete construction projects. 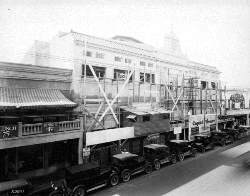 Construction on the Capitol Theatre was started in 1925, but the project was moving much slower than the young partners had anticipated. By the latter part of 1925, both building materials and construction workers were in short supply. The general contractor got to a point where they needed to import contractors to finish the project. By the middle of the summer of 1926, the theater was completed at a cost of $300,000. Once completed, The Capitol Theatre’s interior featured an exquisite mosaic and a magnificent chandelier. The color scheme was predominantly orange, ivory, gold and green giving the interior the appearance of a beautiful tropical sunset. 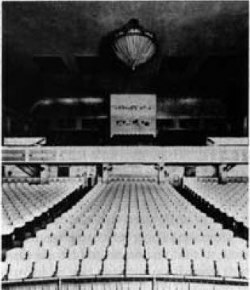 The inside of the theater featured a spacious main seating area along with a balcony and an orchestra seating area. The building was very reminiscent of gilded age opulence with a tropical twist. The unique feature of the building for the time was a make-shift form of air conditioning. The ventilation system consisted of huge fans sending out “currents of refreshing air” that had been forced through a spray of ice cold water. The system was able to ensure a consistent temperature of 70 degrees. The ventilation system was a welcome feature on opening night. The theater officially opened on the evening of June 25th, 1926. There were 1,500 invited guests and the temperature outside was what one would expect on a June evening in Miami. The ventilation system was enjoyed by all attendees on opening night. The next day, the Miami Herald reported that several hundred others were turned away from the grand opening. Grand openings of theaters were celebrated with much greater fanfare than they would be today. The events of opening night at the Capitol Theatre would feature multiple forms of entertainment. The audience was welcomed by Mr. James Donn, and was followed by a Seigbert Asher singing a rendition of the “Volga Boatman”. Next, Miss Evelyn Brown, “Danseuse”, would perform and would be followed by a newsreel. The feature film that night was a Universal Picture Production, “The Midnight Sun”, a drama of Russia under the Czars. According to Mitchell Wolfson many years later, the highlight of the night was the performance of the Capitol Theatre Orchestra. The orchestra was conducted by Mario Armellini, who had been the musical director at the Roney Plaza, Royal Poinciana and Breakers hotels. Wolfson remembers the orchestra was given a standing ovation for their performance. The Capitol Theatre Orchestra became a favorite of Miami residents from that night on. 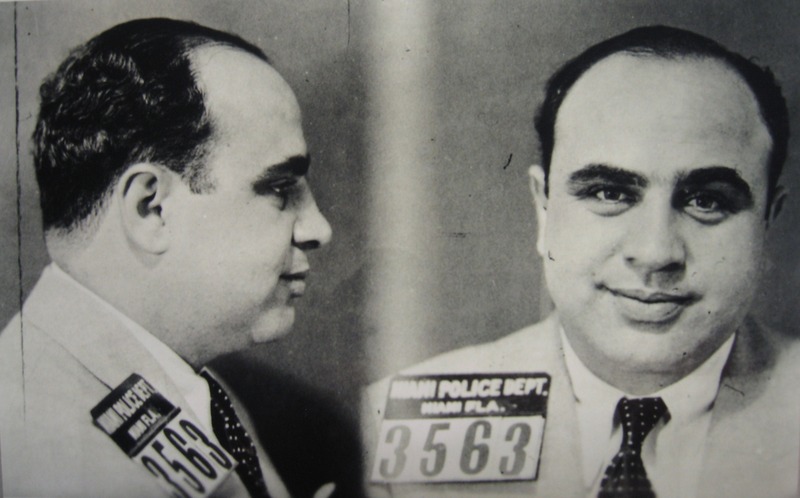 An article on January 1st, 1939 in the Miami News provided insight on the connection of the partners responsible for building an entertainment empire in South Florida. While Sidney Meyer grew up and went to school in Nebraska, he quickly adopted Miami as his home. Meyer had an early history with the motion picture business. He ascended from shipping clerk to general manager in charge of distribution for Fox Films. Mitchell Wolfson was born in Key West in 1900. He attended school in both Key West and at Erasmus Hall High School in Brooklyn, New York. After graduating from Columbia University, Wolfson returned to Miami to become treasurer of the East Coast Wholesale Corp, which was founded by his father in 1884. Sidney Meyer would meet and marry Mitchell Wolfson’s sister. Wolfson and his brother-in-law decided to form a business in 1925. The official name of the company was the Wolfson Meyer Theatre Company. Shortly after the opening of The Capitol Theatre, the two would shorten the name of the company to Wometco. The acronym would feature the first two letters of Wolfson (WO) and Meyer (ME), along with the ‘T’ of theatre and ‘CO’ of company. The Capitol Theater soon became the anchor tenant of the block on Miami Avenue, between NW Third and NW Fourth streets. Less than one month after the grand opening of the theater, the Capitol Department Store opened just south of the theater. 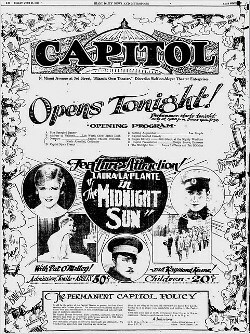 Attempting to capture the excitement of the theater’s opening, they took out a big ad in the Miami Daily News and Metropolis announcing a big sale. The store boasted that they were just “20 steps south of the Capitol Theatre”, located at 304 N Miami Avenue. However, the department store didn’t stay in business long. In the 1930 Polk City Directory, 304 N Miami Avenue was listed as vacant. 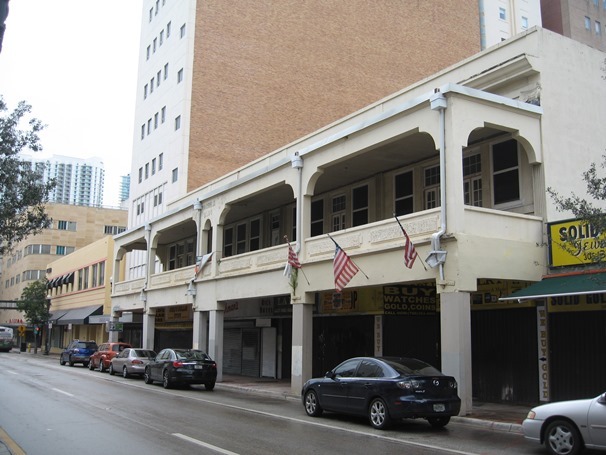 By 1930, there was a Capitol Hotel located at 328 N Miami Avenue. Although the city directory spelled ‘Capital’ with an ‘a’, an advertisement in the Miami News in February of 1929 had it spelled in the same manner as the Capitol Theatre. The Capitol Hotel appeared on the front page of the Miami News on June 22nd, 1955 because one room in the hotel was used as the location for an undercover sting to arrest two Miami Detectives involved in a bookie scandal. The Capitol Theatre experienced its own form of adversity in January of 1932. The Palm Beach Post reported that a bomb had exploded at the Capitol Theatre in Miami on January 4th. There were a few injuries to stage hands, but the audience filed out of the building with minimal panic. The bomb was made with gun powder and sulfur and was ignited with phosphorus. The blaze was put out with fire extinguishers. The theory was that the bomb was placed by a rival motion picture operator’s union as part of a three year fight between union members. When Wometco created Miami’s first television station in 1949, it utilized the theater to launch its new venture. Theater patrons would take the staircase to the second level to watch movies, leaving office space on the first floor for a studio. 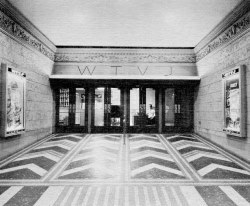 Once the studio was operational, WTVJ was able to broadcast its first show on March 21, 1949 from the theater. It was from this small studio that Ralph Renick began his career with WTVJ as an intern in 1949. He was named news director in 1950. By 1951, the Capitol Theatre was only 25 years old, but was showing its age. At the same time, television was becoming a medium that was increasingly adopted for home entertainment. Wometco decided to close The Capitol Theatre in 1952 and to convert the building into a television studio. The conversion provided a much larger WTVJ studio. The television station moved into and dedicated their new studio in November of 1952. The conversion added 200 spectator seats to the three-story studio to accommodate an audience for its 68-by-100-foot studio on the second floor. The ground floor housed the executive offices, programming and sales departments. The control and projection rooms were on the third floor. As part of the conversion, the floor of the studio was supported by concrete columns that were added 15 feet above the old theater floor and stage. The newly added second floor provided space for offices beneath the studio on the ground floor. The lift in the studio from the ground floor may have been fortunate during hurricanes, but even during the worst of Andrew in 1992, it was the high winds, and not flooding, that concerned Brian Norcross and others bunkered in the WTVJ studios as the storm pounded South Florida. 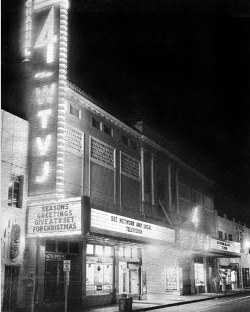 WTVJ operated out of the converted Capitol Theatre building from 1949 until 2000 when they built their brand new studio in Miramar, Florida. WTVJ’s move out of downtown Miami represented the end for the block of buildings along North Miami Avenue. 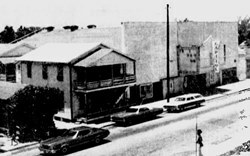 Wometco had been operating a theater in Overtown at 322 NW 14th Street called the Harlem Theater. In the early 1970s, Wometco renamed the Harlem Theater to the Capitol Theater. The time to own a neighborhood theater seemed to have passed. Receipts were down and theater goers were attending movies in suburban malls. In a Miami News article in June of 1973, a Wometco representative stated that the Capitol in Overtown wasn’t taking in enough revenue to even pay for the cleaning service. The theater was earning roughly $75 per day. The Miami News article was entitled “Death for Capitol Theater – Black Neighborhood’s Last Picture Show”. It announced that Dade County had purchased the land and it was only a matter of time before the building would be demolished. The land that the theater once resided is now part of a park that includes the Overtown Youth Center. The former television station buildings vacated didn’t last much longer following WTVJ’s move to Miramar. In 2000, the entire west side of the 300 block of North Miami Avenue was demolished to make room for a Federal Courthouse Complex. While there is no trace of Wometco’s presence on North Miami Avenue today, there is no question that The Capitol Theatre, WTVJ and Wometco will be always be a big part of downtown Miami’s past. The buildings can be demolished, but the memory of each institution will remind of us of a different time in downtown Miami. Feedback: Bryan Norcross, formerly of WTVJ, March 19, 2019. 12 Comments on "The Capitol Theatre, Wometco and WTVJ"
Another great story. Thanks for the history lesson. Few alive remember the glory days but everyone over 60 remembers sitting in the old theater waiting to go into the Skipper Chuck show. I remember going to the WTVJ building as a young child several times to be on the Skipper Chuck Show in the early 1960s which as shot in the studios there. Being born and raised in Miami ( I am 59 ) I of course remember all of the various Wometco theaters around Miami years ago. I remember seeing “Alien” when it opened at the Dadeland Wometco Twin, long since torn down. All were ” nice, clean and with staff who cared” so unlike any movie complex we can go to now. There is probably not a person alive today who was a kid in Miami in the 1950s who did not pass through the WTVJ entry doors in order to be on the Skipper Chuck Show. It was a rite of passage; something that every school happily coordinated. A great piece of informative history. Thanks for the research. As a kindergartner or 1st grader in either 1951 or 1952, I appeared on the “TV Story Club With Ruthie” at the WTVJ studios. I still have a photo from that appearance. A few years later, my 53rd Street Miami neighbor had a local singing program of his own on WTVJ, “The Johnny Viaggio Show,” and my family were guests in his audience one night. Talent scouts for Jimmy Durante caught his show and Johnny went to New York and appeared on Jimmy’s show…quite exciting for our neighborhood. Johhny Viaggio is in his 80s now, and still crooning at clubs in North Carolina. Thank you for sharing your story, Jim. Thank you for the memories. In the early 50’s, Our grandparents owned the Capitol Furniture Store on the corner and our family spent a lot of time hanging out at WTVJ and getting autographs from the stars Great childhood memories. Hi, Arlene. Thanks for sharing your family’s story. Do you have any old photos of your grandparent’s store? I worked at WTVJ, Wometco from 1961-1971. I worked in the accounting office.I started right after I finished high school. I remember Skipper Chuck and also all the great movie stars I had the privilege of seeing plus all the neat animals that the zoo would bring. I was always going downstairs to the studios to see something or someone. I was hardly ever at my desk and wondered why they did not fire me. I have many memories from those years. My father and Ralph Renick knew each other from the Greater Miami Jaycees in 1949-50. Renick was trying to get the members from that organization who owned businesses to advertise on WTVJ. My father owned 2 businesses back then. He said that he would advertise one of them if he could get a tour of the TV studio and meet Mitchell Wolfson. Both things happened. A few months later, Dad had an accident in his moving business and wound up as a patient at Mercy Hospital. Wolfson found out, so he lent him a TV to watch Channel 4 while convalescing in his hospital room, because the hospital didn’t have TV’s for the patients. Wolfson let Dad keep the TV when he went home. Consequently, we were the first one on our block to have a TV! Watching that TV was my first memory of my life. I was 2 years old. I told that story to WTVJ for their 50th or 60th anniversary, but they ignored me. Thank you for sharing your story, Sara. Love these Miami connection stories to great institutions of the past. Sorry that WTVJ ignored your story for their milestone celebrations.